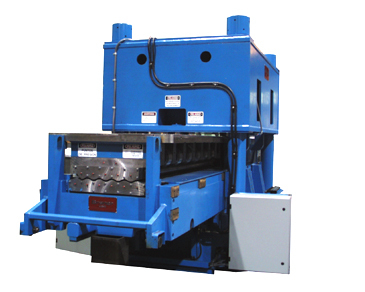 Cassette Levelers: The thickness range capacity of roller levelers is determined by work roll diameter, roll spacing, and load carrying ability. In particular, small diameter relatively closely spaced rolls are required to level light gauge product, while larger and more widely spaced rolls are required to level heavy gauge product. In general, a roller leveler with a given roll diameter and roll spacing is limited to a maximum strip thickness of 3 to 4 times the minimum strip thickness. For example, a leveler with 1.750" diameter rolls spaced on 2.00" centers would have a minimum thickness capacity of .030", and a maximum thickness capacity of .120". Another leveler with 3.500" rolls spaced on 3.875" centers would have a minimum thickness capacity of .075", and a maximum capacity of .300". A coil processor wanting to level from .030" thick through .300" thick materials would need to install two levelers. 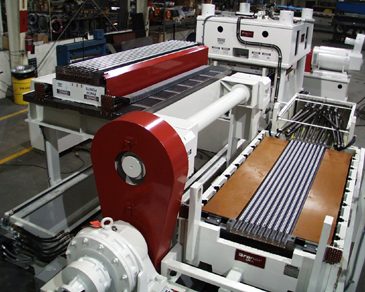 A Braner USA "Cassette Leveler" will extend the minimum and maximum thickness capacity of a single roller leveler by employing multiple interchangeable work roll "cassettes", with each cassette containing a roll size and spacing sized for a different thickness range. For example, a Braner USA Cassette Leveler equipped with a 1.750" work roll cassette and a 3.500" cassette would have the ability to level materials from .030" through .300" thick. The small cassette would be employed to level from .030" through .120" thick materials, and the large cassette would be employed to level materials from .075" through .300" thick. In addition, a Cassette Leveler can be equipped with interchangeable 4-Hi, 5-Hi, and 6-Hi cassettes, allowing the user to process a variety of surface finishes as well as providing an extended gauge range. Hydraulic Leveler "Powered Cassette Injector"
Cassette Injector: Cassettes are installed and removed from the leveler frame by a powered "Cassette Injector", a device that stores one or more cassettes "off-line", and pushes or pulls the cassettes into and out of the leveler frame as required. Cassettes are precisely aligned and locked into the leveler frame by hydraulic cylinders. 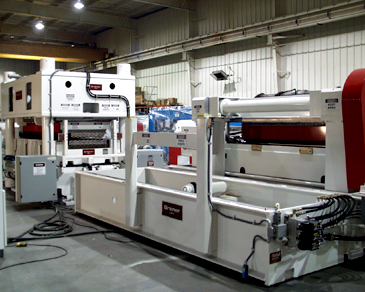 A Cassette Injector designed to handle multiple cassettes will shift from side to side to align each cassette for installation or removal frame, all back-up cylinders are completely exposed and accessible for maintenance. A device that makes Leveler maintenance even easier and faster is the "Power Cassette Opener", an attachment to the Cassette Injector that grips the upper half the cassette and opens the cassette like a "book", exposing the all the rolls. The Cassette Opener allows convenient tabletop cleaning and servicing of one cassette while a second cassette is operating. The ability to service leveler work rolls and back-ups outside of the leveler frame simplifies leveler maintenance, and the ability to operate the leveler with a second cassette while servicing another reduces downtime and improves productivity.